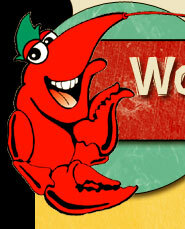 Welcome to The Woodbine Annual Crawfish Festival 2007! Entertainment is offered on Friday night from 6:00pm to 10:00pm at the Satilla Waterfront Park Stage. Saturday's entertainment begins at 9:00 am and continues throughout the day at the waterfront stage as well as the gazebo stage located in the Arts & Crafts Area. A children's amusement area provides activities and games on Friday night and all day Saturday. 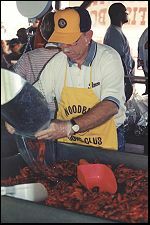 The Crawfish Parade is one of the highlights of the festival and is enjoyed by young and old alike. It begins at 10:00am at the corner of U.S. 17 and E. 10th Street and features entries such as bands, clowns, floats and horses. A 5K Run and 10 Mile Individual Time Trial Bike Race will be held Saturday morning. 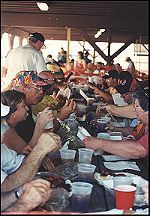 Food concessions offering such mouth watering treats as Crawfish Boil, Crawfish Woodbine (Etoufee), Fried Chicken Dinners, Red Beans and Rice, Homemade Desserts, Barbecue, Funnel Cakes, Ice Cream and much more are available Friday night and all day Saturday. Our Arts & Crafts show is highly acclaimed by vendors and patrons alike. We strive to produce a quality show with a variety of hand crafted items from wood working to quilts. We also feature an antiques area, as well as a commercial merchandise area. This area will be open for your shopping pleasure of Friday night from 5:00pm to 10:00pm and on Saturday from 8:00am to 5:00pm. Parking is available along Bedell Avenue (U.S. 17) and all side streets from 4th Street to the southern City Limits. Any vehicles parked on private property or blocking private drives will be towed at the owner's expense. For the health, safety and enjoyment of pets and festival goers, pet owners are encouraged to leave their pets at home.